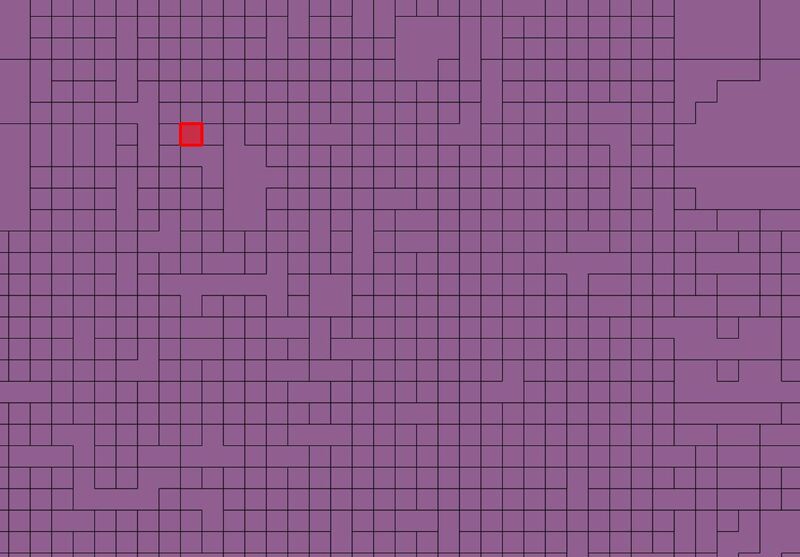 Polygonizing a raster yields lots of little squares? 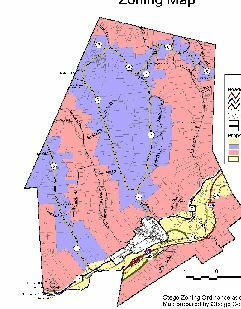 I have a pdf with the area of a county that I want to separate into multiple shapefiles (polygons) based on color. As shown in the first picture there are 4 colors so I would need to separate based on color between those four. But first, I need to convert it into a vector (unless there is an easier way). Doing so, I get the second image as an output by using the polygonize tool which when zoomed in very close, has a lot of tiny squares where color should be different. I was wondering if there is a way to break a raster up by color even though the image isn't smart. You need to "round" colours to a restricted palette. PCT is a paletted format, that stores up to 256 discrete colours in a lookup table. Dialog lets you set number of colours. In your case, probably 4 or 5. 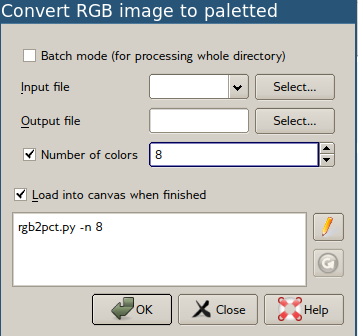 It will then reduce the raster to 4 or 5 colours. When you vectorise that, you'll end up with much larger regions. Note that this uses dithering, so the regions will still have single-pixel noise. You might be able to use sieve to force small neighbouhoods to take on the value of larger surrounding areas. Have a look at the manual page as it's possible to give it "hints" as to the colours you want. You could use Value tool (QGIS' equivalent of Photoshop's 'eyedropper' tool) to find the colours you want. This is available in the Orfeo Toolbox, which you'll need to install and enable separately. Once that's done it's available in processing. K-Means allows you to specify a number (K) of clusters, and will automatically find the K most "representative" colours. This can give better results, but will be more tricky to install, and you may need to "train" it or run it multiple times to get a good result. Here's an example of the Natural Earth Hyposmetric Tint raster classified into 5 clusters. 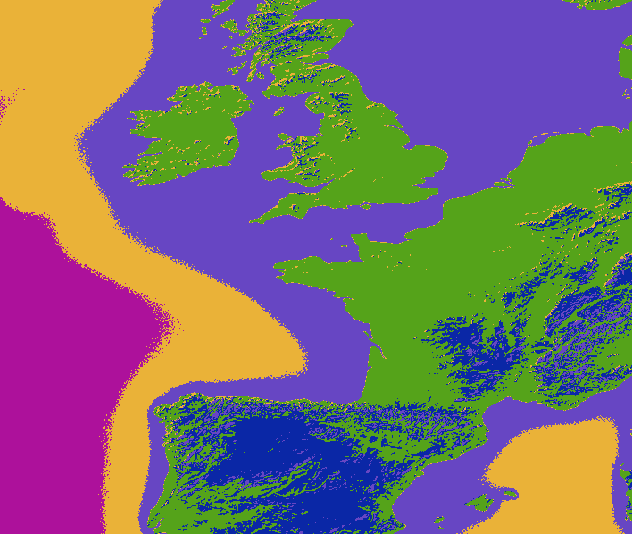 There is still some noise around colour boundaries, but contiguous areas of colour are much larger. Not the answer you're looking for? Browse other questions tagged qgis raster shapefile raster-conversion polygonize or ask your own question. 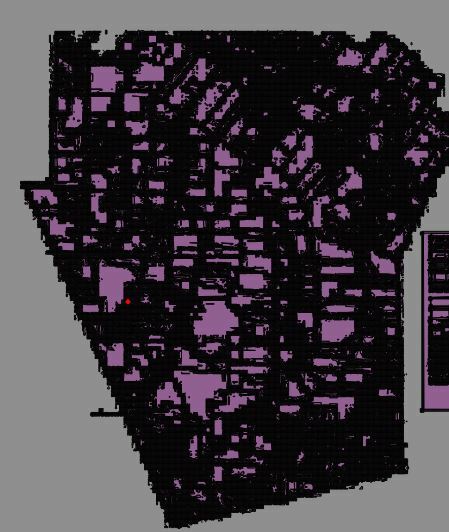 Specifying values in stretched raster histograms of ArcMap? Is there a way to break up an image file into separate polygons based on colour? How to keep polygons detailed when exporting in QGIS?